Well ok, I do admit the Tower unit is not revolutionary , as the advertising video says it is. And there is nothing new about it, the control panel is the same old fashioned ‘dial’ type that was common on all Halogens of a few years ago. Nor does it have my own favourite extension to the Halogen design, which is the hinged lid, as seen on the Andrew James models……..
….. there are lots of customers out there who are unconvinced about these kitchen marvels and it may be ‘horses for courses’ or just going for the tried and tested design. So here is the Tower T14001. It really doesn’t get more basic, but Tower do have a long history and have produced some top kitchen gear in the past, in fact looking around my own and my Mums kitchen, I found no fewer than 6 Tower products, some very very old. Best of all it has a 3 year guarantee. Very conventional dial type controls time 0 to 1 hour and Temperature 125 to 250 in degrees Centrigrade. I did notice that there were a lot of conflicting comments about cooking chips. Having used many Halogen ovens I can say that they produce excellent chips, frozen prepared ones are by far the easiest, fresh cut ones must be dried thoroughly before you begin and will take more time , spray on oil ( there is a useful little bottle with this model ) can be used and will give a better finished product. 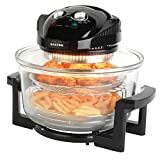 The best way I found, and for ease of use , is to purchase the airfryer accessory, this works very well in the conventional design Halogen oven, especially if you’re cooking multiple things at once. It cooks food loads faster than both our standard oven and the Halo Health Fryer we had previously. * It has 2 racks, meaning you can cook chips and chicken for example at the same time. I cooked chips in and they are really the best I ever had at home. Putting the bits together is a little more difficult than it looks however. It comes with tips and idea for you to try. It is fast and efficient. It arrived in record time (within 2 days). It cooked a whole roast chicken(2kg) in an hour and it was lovely ! Probably not big enough for a family of more than four people but I am surprised at how much I am using it.